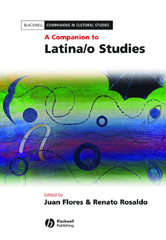 A Companion to Latina/o Studies is a collection of original essays written by leading scholars in the field, dedicated to exploring the question of what 'Latino/a' is. Brings together in one volume a diverse range of original essays by established and emerging scholars in the field of Latina/o Studies. Offers a timely reference to the issues, topics, and approaches to the study of US Latinos - now the largest minority population in the United States. Explores the depth of creative scholarship in this field, including theories of latinisimo, immigration, political and economic perspectives, education, race/class/gender and sexuality, language, and religion Considers areas of broader concern, including history, identity, public representations, cultural expression and racialization (including African and Native American heritage).